,,I am particularly pleased to be here today, because we are discussing a topic that directly affects my country as well. As the prime minister of Curaçao, a Small Island Developing State in the Caribbean, I can attest that the link between climate change and security is clear and undeniable to our people, and to those of other countries of the Kingdom, particularly Aruba and St. Maarten. Increased climate variability threatens social stability. It can ultimately lead to displacement and regional tensions. And where climate change threatens international stability and security, this Council has a responsibility to act. What if we had known 15 years ago that in 2018, millions of people in the Lake Chad region would need relief assistance to survive, with water stress as one of the threat multipliers? What if we had known that millions of people from Somalia would still be displaced against the backdrop of severe droughts? What if we had known that climate change would constitute an existential threat to Small Island Development States, like my own? These questions may seem irrelevant, since we cannot change the course of history. But what we can change is how we apply the lessons we have learned so far. By responding in a timely manner to warning signs, also when it comes to climate-related security risks, we can adequately address root causes, prevent instability and conflict, and sustain peace in the future. Recently this Council has taken significant steps towards recognising climate-related security risks, as you just mentioned. First, with resolution 2349 on the Lake Chad Basin, followed by the Presidential Statement on UNOWAS and the UNSOM resolution, and the request for UNAMI to assist the Government of Iraq on facilitating regional dialogue and cooperation on water. And most recently the MINUSMA mandate. I also recall the briefing on the Lake Chad Basin under our Kingdom’s Presidency, in which the majority of us agreed that climate change is a threat multiplier in the region. The Council is starting to prove that it is responsive to the security impact of climate change, where and when it matters. 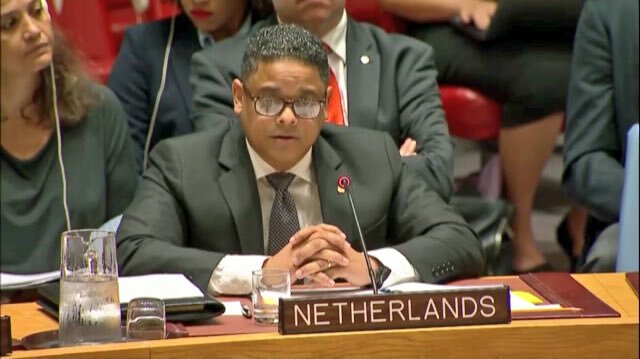 The Kingdom of the Netherlands strongly believes that the Security Council must ensure appropriate action by the UN, here in New York, but especially on the ground, in the affected countries. This requires the United Nations to have the capabilities that match the extent of the challenge. By this I mean, firstly, an increased analytical capability, which is needed for joint risk assessments, conflict analysis and early warning. And I truly hope we can agree on the need for better analytical information. Secondly, the capability to manage risks. Encouraging more and better programming, notably prevention, stabilisation and development efforts that are conflict- and climate-sensitive. And thirdly, monitoring, assessing progress and modifying our programming when necessary. We will continue to encourage the Secretary-General to include climate-related risks in his reports to this Council, when and where this applies. To advance this agenda, we also believe that the UN needs an institutional home on climate and security and therefore we also applaud the initiative to launch a knowledge hub on this subject. Institutionalised cooperation, which is properly coordinated and embedded across the UN, and which will enhance and accelerate how existing UN agencies tackle this challenge. As a current member of this Council, we are ready to shoulder our responsibility and contribute to this end. On many occasions, the necessary actions will need to be taken on the ground by entities other than the UN Security Council. Both the UN Secretariat and other UN bodies have a role in assessing and managing climate-related security risks. In addition, the international community at large should also play its part. 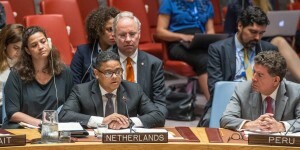 Assuming our responsibility, the Kingdom of the Netherlands continues to offer a platform for the climate and security debate, through our annual Planetary Security Conference, in which Curacao of course will also participate. We hope all interested parties make optimal use of this platform to explore solutions to climate-related security risks in Mali, Iraq, Lake Chad and of course the Caribbean SIDS. Climate-related insecurity can affect us all. As the prime minister of Fiji put it: ‘We’re all in the same canoe.’ I would also like to cite Thomas Friedman, who concluded that ‘the only way to steer is to paddle as fast as or faster than the rate of change’. In this case: climate change. In conclusion, we believe this Council has an important role to play. It is up to the Security Council to prevent instability, insecurity, and the displacement and suffering of people everywhere.